Kellyn McMichael a Lilburn native, received her classical training with the Northeast Atlanta Ballet under the direction of Jennifer Byokawski-Gordon, where she was privileged to perform lead roles in Tchaikovsky’s The Nutcracker, Swan Lake, Coppelia, and Cinderella. She furthered her classical ballet training at the Joffrey Ballet’s Summer Intensive in New York City from 2001-2003, under the notable instruction of Francesca Corkle, Winthrop Corey, Deborah Donn, and Elie Lazar; and, was also offered a position in the Governor’s Honor Program for ballet. While studying in New York, Ms. McMichael was given the opportunity to model for the reputable Art Stone The Competitor costume company from 2002-2004. 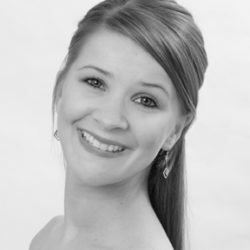 Ms. McMichael performed professionally with The Georgia Ballet under the direction of Gina Hyatt-Mazon, performing in the ballet’sMary Poppins, Swan Lake, Tchaikovsky’s The Nutcracker and a number of contemporary works. Her professional experience continued with the Louisville Ballet, under the direction of Bruce Simpson and Helen Starr, performing in Kathryn Posin’sScheherazade, Tchaikovsky’s The Nutcracker, and Swan Lake. Ms. McMichael has been teaching classical ballet and beginning tap with the Lilburn and Grayson School of Ballet since 2003, her students ranging from Pre-Ballet to company level dancers. Ms. McMichael has always had a love and passion for classical ballet and strives to offer great training to all of her aspiring ballerina’s. She now resides in the Lilburn area with her beloved husband, Nathan, and growing family. © 2018 Northeast Atlanta Ballet. All Rights Reserved.